If you’re inexperienced with drilling a water well, doing it yourself or watching tutorials online will not make the job any faster or less expensive. It will put you and whoever is involved in more danger which will only add complications to the matter. Some Michigan homeowners are sick of seeing a monthly water bill on their doorstep, so they consider alternative means to get their water supply. While having your own water well is a smart investment, attempting to install one yourself is not. For the sake of your wallet and the quality of your water, here are a few reasons to hire an Port Huron well drilling company. Well drilling companies dedicate a lot of time and resources to training their staff. That experience ensures that they can provide their customers with the personal water well they need. It takes specialized knowledge to operate a water well drilling rig. The two drilling techniques used for creating water wells are cable drilling and rotary drilling. If you have no idea what either of those are or how it should be done, you definitely shouldn’t be operating such heavy equipment. Drilling a well without experience not only can do more harm than good, but it can also risk your safety. Well drilling is a task that is not meant to be rushed. When connecting a source of water to a Michigan home, you need to make sure that there’s a reliable flow of water. Also, that water should be filtered and pressurized before it gets to your property. You also need to know how to test the water to make sure it isn’t contaminated by other minerals after it runs through the filter. To confirm the water’s safety, you have to see, smell, and taste the water after it goes through a variety of tests. To decrease the complication, your best bet is to ask a Port Huron well drilling company to install the well for you. They’ll go through all the necessary tests to make sure your water is safe for use. One of the benefits of having your own water well is its low maintenance features. When a water well system is installed correctly, maintenance checks aren’t needed very often and you won’t ever have a water bill again. Having said that, if you decide to handle it on your own, you may make matters worse. Problems with water pressure, the water pump, or the taste of water might be simple to solve. But if you choose to try and fix the problem yourself without the expertise, you may end up making it worse and causing more issues. You don’t have to deal with these struggles and risky complications when it comes to your water well. 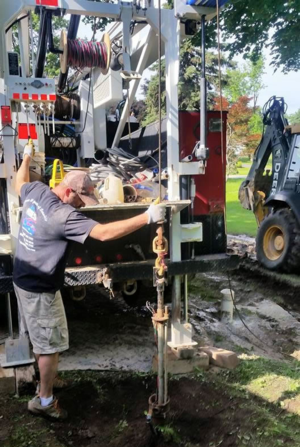 Contact Ries Well Drilling Inc. today to make sure your residence has a reliable water well installed by a professional Port Huron well drilling company. Ries Well Drilling is headquartered in Washington Twp, Michigan and provides water well service and installation in Macomb, St. Clair, Oakland, and Lapeer counties.